Eltronicschool. - There are many device application that used servo motor because this motor can be used with more cheaper that used stepper motor. When we used stepper motor, it is can rotate 360°, 1 step = 1,8° (mostly). Servos can rotate only from 0° to 180°, 1 step = 1°. But why are they working this way, inside them we will find potentiometer which rotates as servo (up to 180°), but have 1024 steps. And how to design servo DC motor have 1024 steps? please follow this step according article that published from Intructables site like below. Soldering iron and small screwdriver. Open it and remove the electronics. 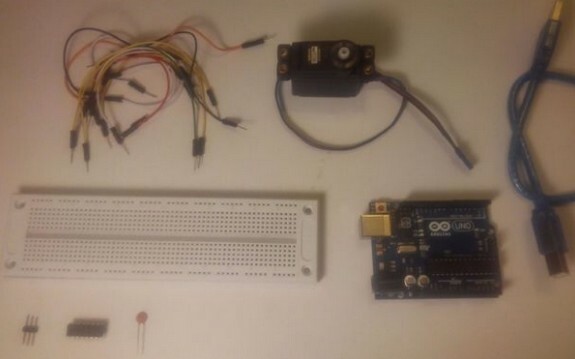 Leave the potentiometer and DC motor. If your engine don't have capitator I prefer to solder one to it, that is not needed, but with capitator your motor will have more power. Than solder the wires to engine and potentiometer, so you can put them into breadbord. Please read more this How to Design Servo DC Motor Have 1024 Steps here.